Sidewalk is broken all the way across, uneven and causing a hazard. Please fix. Requester reports the bike rack in front of this address is in need or repair and re-anchoring to the ground. Thank you for reporting this issue. We are aware of the damage to this bike rack and are in the process of coordinating repairs. We'll post an update when the repairs are complete or the bike rack has been replaced. We have determined that this rack cannot be easily repaired. This week, abandoned bikes were tagged and removed. The entire back rack will soon be removed (a replacement has been ordered and will arrive late this year). Signs will be posted immediately before removal, but consider using other nearby bicycle parking to ensure your bicycle is not attached when the bike rack is removed. DPW - so you state that the "entire back rack will soon be removed," but the replacement won't arrive until "late this year." So, there won't be a bike rack there at all for months? Yes, there is another bike rack nearby, but the first block of N. Winooski Avenue sees a tremendous amount of bike parking, with no less than six restaurants/bars there. I think something temporary is in order. Sidewalk is almost completely gone and a trip hazard, on a very busy road leading to City Market. Hole in pavement next to catch basin on the corner of Adsit Ct and Willard St.
Issue 4740092 has been marked as a duplicate of this issue. I live at 44 North Avenue and received a flier asking for input on changing an ADA parking space to a regular parking space. I don’t have a problem with the city making this switch. What I would really like is for the city to fix the road in front of my house. Currently, when it rains (or snows in the winter) a giant puddle forms in front of our house. It occasionally gets so big that when a car drives through it, the puddle actually splashes the front door, which is 4 stairs above sidewalk level. We have dumped hundreds of dollars this year alone (not to mention a substantial amount of hard work and time) into growing a viable lawn in the green belt. It looks better than it has in years past, where we’d just let that strip of land be a dry strip of weeds and dirt, however as the summer goes on and the green belt is pounded with water from the puddle, the grass is slowly dying and it’s going back to the state of mud in a storm and grass patches the rest of the time. Please have the city fix the road. Ticket and tow these cars. The city and the neighbors went through a legal action and developed a parking plan. Increased impermeable soil is killing Lake Champlain. On Tuesday at 10:21 a.m. a citizen sent this attached photo to my e-mail making the same complaint. I was in the area at 10:39 am, just 18 minutes after that complaint and there were no cars. Thank you for reporting the concern on SeeClickFix. This is the proper way to make a complaint. This is not lawn so we cannot issue the car a lawn parking ticket. The area is in front of a garage door and inside the garage is a parking area. 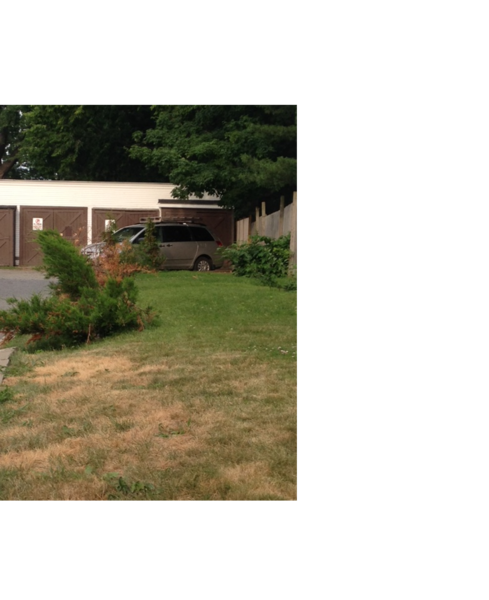 The agreement that was reached with the city and the property owner designates this spot in front of the garage door would not be used for parking. The enforcement remedy for this is not as speedy as the city towing the car. We have no legal authority to tow cars from private property. The city would need to get a search warrant signed by a judge before we could enter private property and tow a resident's car. 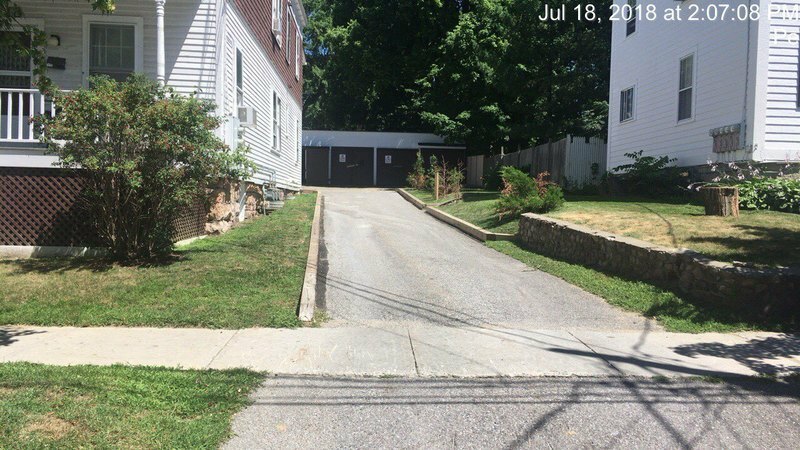 The property owner had indicated he would have cars towed if they parked in the area on his property that was designated in the agreement as no parking. I sent him the the complaint photo from today. We will check the property. This time stamped photo shows no one is parking there at this time. Thanks for checking and documenting although I'd suspect that vehicles are parked outside designated the area outside of work hours. In my experience, nearly every scofflaw knows just when it's safe to avoid detection and that's not between 7-5 on M-F.